19.04.2017, Strasbourg – As part of his visit to Strasbourg, Georgian First Deputy Foreign Minister David Zalkaliani held a meeting with Secretary General of the Council of Europe Thorbjørn Jagland. 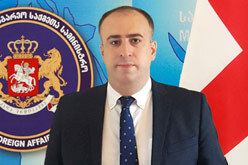 David Zalkaliani provided the Secretary General with detailed information regarding the human rights situation in Georgia’s occupied regions. Discussions focused on isues relating to ongoing and future co-operation between Georgia and the Council of Europe, as well as on the implementation of projects under the Council of Europe Action Plan for Georgia. According to David Zalkaliani it is important that the the problems relating to Georgia remain high on the Council of Europe's political agenda. In this context, he emphasized the importance of the Secretary General’s consolidated reports providing the international community with objective information on the recent development of events in Georgia’s occupied territories. Thorbjørn Jagland reaffirmed the Council of Europe’s unequivocal support for Georgia’s sovereignty and territorial integrity.